Shinwa's inaugural folder, the “Nanashi” is a clever mashup of paradoxes - graceful yet fierce styling, a design that's both traditional and innovative, a modern pocket knife built by masters of ancient swordcraft. And like so many contrasting delights - salty and sweet, yin and yang - the results are nothing short of spectacular! But, then, you'd expect no less from from the samurai weaponry experts at Shinwa. Long celebrated for its world-class handcrafted katana, the Nanashi represents Shinwa's first foray into the world of pocket knives. Forged from resilient titanium-electroplated stainless steel, the Nanashi’s robust 3 1/2" blade features delicate, flowing curvature, offset with sleek lines and keen, angular beveling. The distinctive profile exudes both grace and potency - like an agile ninja assassin moving fluidly through the night, striking silently, lethally. Extraordinarily versatile, the blade's unique upswept arc design yields incredible penetrating power, vigorous slicing ability and clean, precision cutting that's second-to-none. From tough chores like cleaving stout rope to finer, more nuanced tasks like woodcarving, the Nanashi capably tackles any cutting job, maintaining its carefully honed, razor sharp edge through it all. 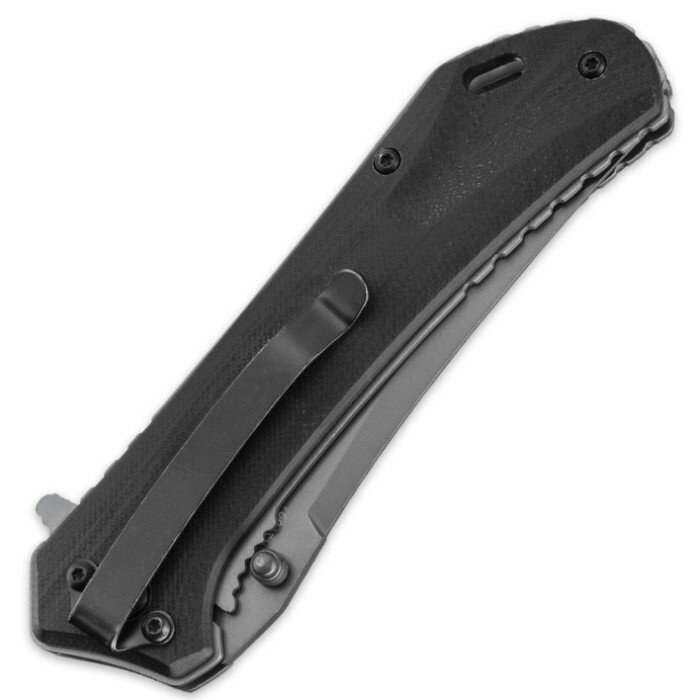 Ambidextrous thumb studs, a well-placed flipper and a velvety smooth assisted opening mechanism allow for lightning fast, one-handed blade deployment. The Nanashi’s ergonomically contoured, matte black handle is every bit as impressive as the blade. Cutting edge G10 handle scales combine outstanding durability with superb hand-feel, while precision etched kanji offer an aesthetic homage to Shinwa's Japanese cutlery heritage. The handle as a whole is ideally weighted to counter the blade, making the impeccably balanced Nanashi an all-around pleasure to wield. It's also a pleasure to carry, thanks to its comfortable 4 1/2" closed length, as well as convenient built-in pocket clip and lanyard hole. Serious sword enthusiasts have long relied on Shinwa's top-of-the-line katana for unrivaled performance, rock solid reliability and flawless craftsmanship, and now - thanks to the Nanashi - pocket knife fans can enjoy the same level of quality. There’s no question - Shinwa’s Nanashi Assisted Opening Pocket Knife represents the dawn of a brilliant new era in cutlery! There are a few faults with this knife, but that's to be expected at this price point. First, the hardware should be immediately removed, cleaned, and loctited when you get it. I lost one of the handle screws a few hours after receiving this knife. Luckily, I have a box of assorted hardware and found a replacement. The pivot also needs to be loctited and adjusted to where the blade is centered in the handle. The flipper tab is a bit rough, and will begin to wear your finger out if you are a fidgeter like me. All the serrations, on the flipper and on the liners, are rough, and take some getting used to. The good: it takes a very good edge, and is easy enough to resharpen after some use. I assume it's a 440 grade steel, which is fine for daily cutting chores. The blade profile is fantastic, I wish there were more higher end knives in this blade profile. It's balances out well with the handle; it's shaped jusr right to allow for a natural slicing motion. The overall design was well thought out, or at least appears that way. With a higher grade steel, softening of the rough spots, and wood qaulity hardware, this would easily be a more expensive knife. I can't see any reason to NOT recommend it as a cheap user. Been a huge fan of Shinwa swords for quite some time. I was VERY excited to see that Shinwa was making a folder. Ordered one on the first run and was very impressed and pleased. Opens fluidly and locks securely. The edge is very good and extremely functional. Plus, the knife just looks unique and badass! I got a second one for my collection on the rerelease. Order one today...you will NOT be disappointed. Love being able to say I carry a Shinwa everyday! The knife has an attractive blade shape and is razor sharp and lock-up is very good - you have to push hard on the liner lock to close the blade. 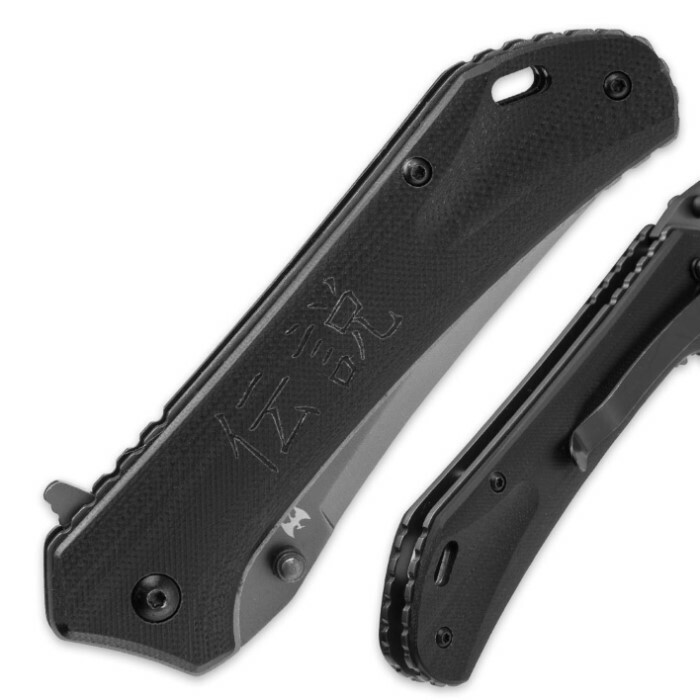 Unfortunately, it should only cost around $10.00 as the blade is thin, and is only around 3.25 inches long (compared to product description claiming to be 3.5") plus closed length is too long being 4.75 inches long (compared to product description claiming to be only 4.5"). A beautiful knife very sturdy. I love it. It has become my new edc knife. I feel like I have a samurai sword in my pocket. I recently purchased this knife and it is great. A first from Shinwa (pocketknife) as they usually make swords, which I own several of. The knife is extremely sharp and opens very fast. It is comfortable to carry in your pocket and is very well made. For the price of this knife it is well worth buying and if you know someone that appreciates a great knife it would make a great gift. Hopefully they will make more knives like this and continue a tradition that started with their swords. This knife has to be one of the best value purchase I’ve ever made thru Budk. The picture in the budk catalog doesn’t do justice to this knife. The knife is solid and well constructed. The geometry of the design makes for a comfortable and solid fit in my hand in either forward or reverse grip. The blade is tight and after a little break-in cycles, it snaps to full battery in a smooth fast action. The blade was truly razor sharp right out of the box — one of, if not the sharpest factory edges I’ve ever seen. The G10 scales are shaped and finished to a quality I would have expected from a much more expensive knife. I can’t speak to the quality of the blade steel since it was not indicated on the blade nor referenced in the catalogue description. However, the blade marking does indicate the blade has a titanium coating. This is truly one knife every knife lover should have in their collection. 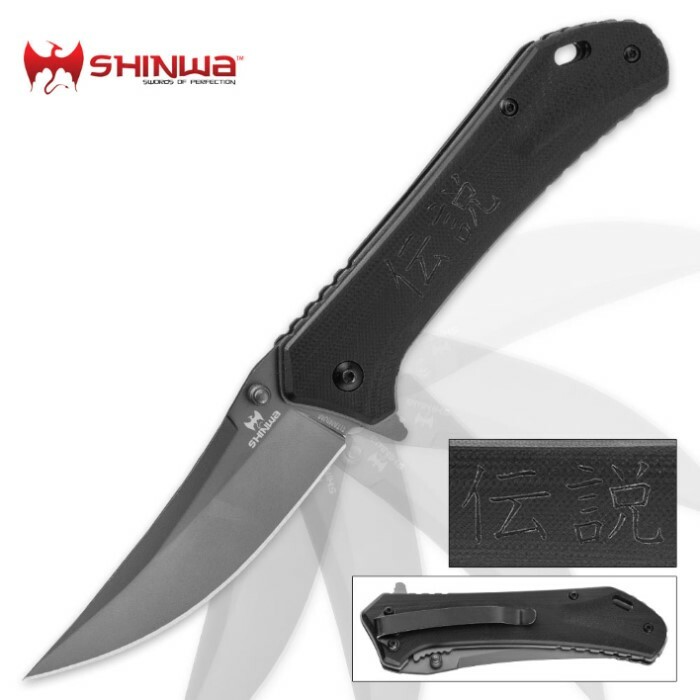 I can’t wait to see new knife design offerings from Shinwa. Overall, for the price point this knife sells, this is a superb value to good to pass up. just got my shinwa nanashi today and I am pleased with it sharp out of the box,stropped it with my belt type sharpener and it is you better be careful with it sharp now. Spring assist is strong locks open solid nice feel to the handle all in all really solid knife I think I will buy a couple more. Solid. well constructed knife. Locks up nice and tight. No wiggle and a g10 handle. Buy this knife, you wont regret it! Razor sharp out of the box and it just feels right in the hands.